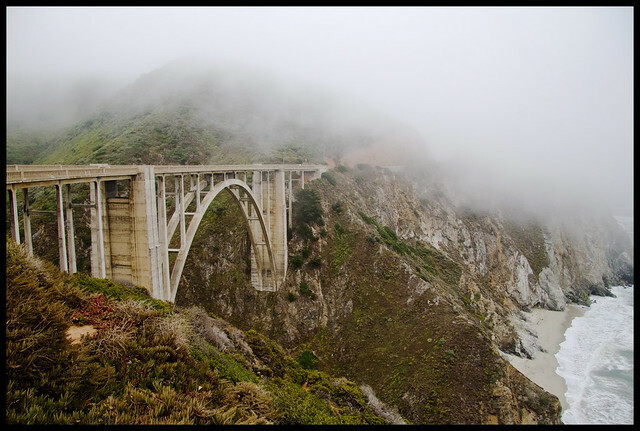 I'd been told many times that Big Sur was unmissable and I definitely wanted to visit it as I was already so close. As I wasn't driving in the US I was left with two options. The first was to catch a bus, or more accurately busses down the coast but this was going to take several hours and a number of changes and so, in the end it didn't seem worthwhile. The second option was to cycle along the historic Highway 1. I'd spoken with the guy at the front desk in the hostel who told me that it was a pretty easy ride, perhaps 20km or so in total. I haven't cycled much over the last few years but this sounded like a nice day out, so I headed out in the morning and took the bus to Carmel to start the ride. It took me an hour of walking around to find the bike rental store, as US towns are not built for pedestrians, but eventually I left, with my newly rented bike and my bag full of camera gear. I asked the guy in the shop for confirmation of the length of the ride and was a little surprised when he told me that it was more like an 80 km round trip, but up for a challenge it seemed like it was going to be a fun day. I headed out into the cold ocean fog and felt fantastic cruising the roads down onto the coast, blood pumping and me quickly warming up even without much sunshine on me (though given the state of my sunburn this was a good thing). Anyway, the hill in the middle of the ride was hard on the way to Big Sur, and truly horrendous on the way back. It took me two and a half hours or so to get to Big Sur and by this time I was already exhausted and my back was in almost constant spasm. With the wind blowing North to South I was rather worried about the route back, and indeed after a quick lunch and a stretch I was back on the bike, and even on the relatively flat start I struggled with the incoming wind. I was worried that the big hill in the middle was going to finish me off and I pondered about how easy it would be to flag down a ride if I was really struggling. Thankfully I managed to push through and didn't stop on the ride up the middle hill, but instead took my mind off the pain by counting down from 100 over and over again through each peddle stroke. The ride the other side was fantastic, though my back was giving me such big pains by this point that nothing was terribly enjoyable. I should note that despite all the complaining above the ride was spectacular, and it has often been said to be one of the most picturesque routes in the US. I have to say though that I've done similarly spectacular rides in England, Scotland and Wales and would recommend anyone taking a ride along the Cornish coastline, or the Northernmost reachest of Scotland to see similarly breathtaking views. Six hours after starting out I found myself back in the bike shop and still had another hour's walk plus the bus ride to get back to the hostel. I spent as much time stretching my upper back as possible, but the spasms by this point had turned to a monotonous tension that wouldn't go away. Before crashing into bed I guzzled up two burgers, a huge milkshake and a big bowl of clam chowder. By 8 in the evening I was in bed, and soon after had passed out completely. The next morning I woke up expecting to be in agony, but in fact was feeling fine, though with a general feeling of muscle fatigue. My back on the other hand had turned from pain to complete numbness and I had no feeling at all in the upper left part of my back. I worried that I'd done myself some spinal damage, the rucksack somehow pressing into a vertebrae and it wasn't until I could see a doctor in Munich a few days later that I was told that it was probably just local nerve damage from the pain in the muscles and that it should be fine in a matter of a couple of months. One month later the feeling is slowly coming back and all should be fine again in a few weeks. Yet another tick for Jon's stupidity when it comes to pushing myself! The morning after the ride I was due to head back to San Francisco and had put up a note in the hostel asking for a rideshare. A guy was heading to SF airport and offered to give me a lift there. He had been living on the East coast of the US for 30+ years but had origininally been born and raised in Steinbeck's hometown of Salinas. He asked me, very apologetically if I wouldn't mind if we took a quick nostaligic tour through his old haunts. On the contrary I assured him, it was about as much as I could have hoped for to have a personal tour of the town I'd read so much about. It was frankly the best hour of the whole time in the Monterey area and I couldn't have asked for a more perfect Steinbeckian tale to end the journey. We went back to the old streets of his childhood, 40 or so years previously, and he recounted tales of his schooldays, and of getting in trouble in the surrounding hills and valleys, of local misfits and life in the factory for his father - in fact the same factory that Steinbeck worked for some time - the local Spreckels Sugar Beet processing plant. He told me about historic brawls and of the two Mexican kids in his class, of what has come of his old school friends and of how things had changed in the intervening years. The dry hillsides surrounding Salinas and the gently rolling hills fulfilled every image I'd had of this part of the world, and frankly no biography or local history book could have given me more of a taste of where his stories had come from. We finally stopped off for half an hour at the National Steinbeck Centre which is well worth a visit if you're in the area and are a fan of his writing. Anyway, I made it back to San Francisco and the next few days were a relaxed last Californian breather before heading back to Europe. I went to see friends in Palo Alto and spent time hanging out with my good friend Alex and his daughter Sahtah before diving headlong into work. Since I arrived back in Munich a month ago I've been for one week in central Germany with a collaboration, a few days in Poland in both Warsaw and Krakow at a Marie Curie conference and giving a talk, and then, after five days back in Munich, I was in Beijing for two weeks giving a half a dozen talks and starting a new collaboration with a soon-to-be office mate in Munich. I'll try and update these stories in the coming week, though right now it looks like just about every minute is taken up with projects of various kinds.